Women, if wearing oversized gloves designed with men in mind has started to frustrate you, this glove is for you. Designed by recognized brand name Minuteman specifically with the unique shape of a woman's hand and wrist in mind, this glove will be a perfect fit. 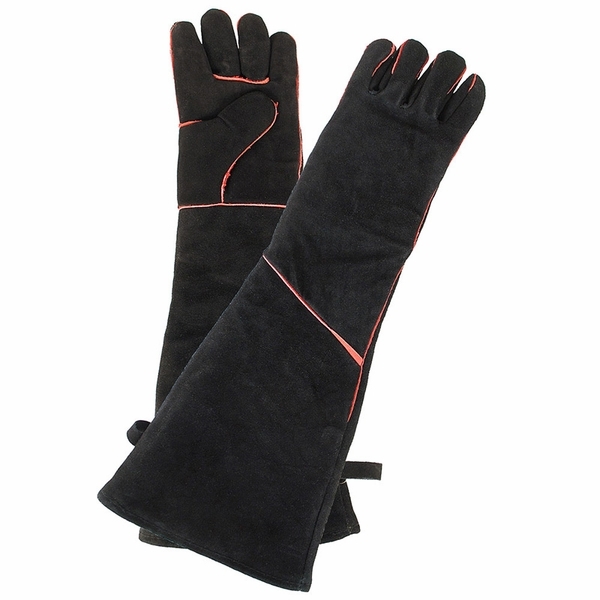 Protected by a 100 percent cowhide exterior and a fully insulated felt interior, you'll never burn your hands again while working in and around your fireplace. These gloves feature special protection for the finger tips, a sensitive area, as well as a hanging loop for easy storage. Comes in black with red trim. The size is perfect for a woman's hands! They come to my elbows, so I can fill my arms and handle a load of firewood without getting splinters or dirty. And those are just the extra benefits! The real good news is that I can truly reach into my fireplace and adjust burning logs, add wood to a roaring fire, pick up embers, etc. without damaging the gloves or my skin!!! All this plus they were not expensive and arrived in a couple days! Bought these for my girlfriend. All the other gloves in the past were designed for larger hands and she had difficulty gripping the firewood. Since obtaining these she has had no problems with handling the firewood. She loves the length and the red touches. Great Gloves for the Hearth and the lady in your life!! Love the gloves, have used them a lot. Great fit and length. These seem to be well made. I like the insulation and they have lasted through the winter for me. They are a little snug since I have large hands. I use this product to quickly move hot coals and rearrange the wood in my stove. Use with care.